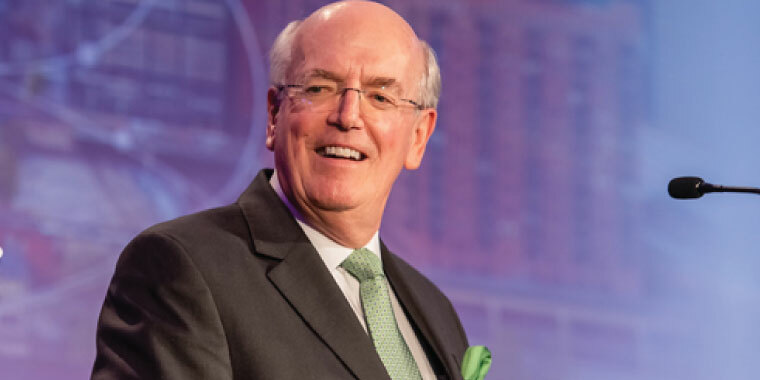 James Koelbl, DDS, MS, MJ, KCU vice provost for oral health initiatives, was honored March 17 with the American Dental Education Association (ADEA) 2019 Distinguished Service Award. Koelbl received the award during the opening ceremony of the ADEA’s Annual Session and Exhibition in Chicago. This premier award recognizes an individual’s significant contributions to ADEA and its members through research, teaching or service. Koelbl joined KCU recently to assist in its due diligence for establishing a College of Dental Medicine on the university’s Joplin, Missouri, campus to serve the four-state area. He is working to assess faculty and patient needs, as well as lead the process to explore program accreditation. Koelbl is also leading outreach to the regional dental community and potential clinical partners. The Distinguished Service award is bestowed only when the chair of the ADEA board and board of directors wishes to recognize an individual who has made an extraordinary contribution to dental education. Dr. Monty MacNeil, ADEA board chair, made the nomination, which was unanimously approved.